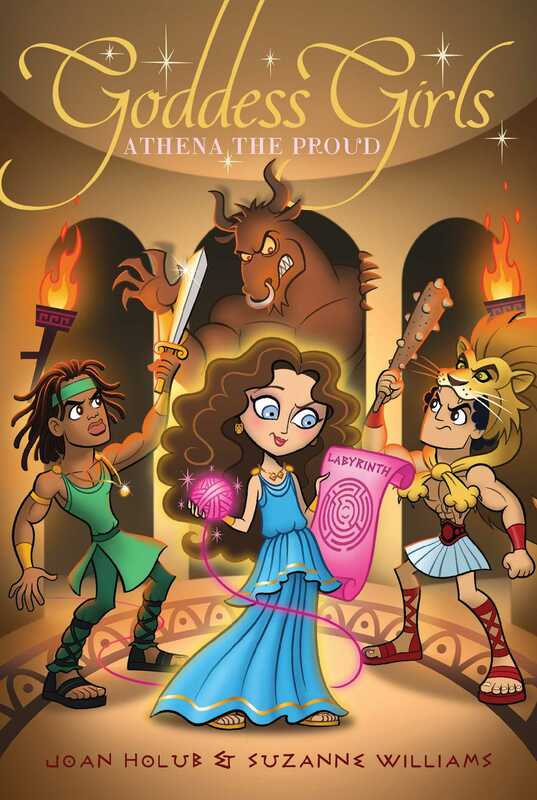 Athena wants to upgrade a labyrinth for King Minos, but her approach causes problems in this Goddess Girls adventure. Athena’s arrogance gets the best of her when her attempts to improve King Minos’s labyrinth have unexpected—and disastrous—results! PING! PING! ATHENA SLID INTO her seat in her Beast-ology class at Mount Olympus Academy just as the lyrebell for second period rang. She pushed her long wavy brown hair back as she pulled her textscroll for the class from her bag. Right away her dragon-headed teacher, Professor Ladon, held up a rolled sheet of papyrus. “An interesssting letterssscroll hasss arrived, which I will now read aloud sssince it concernsss sssome of you,” he announced to the class. Licks of flame flew from his lips as he spoke, setting the edge of the letterscroll on fire. “Godnesss!” he exclaimed. The teacher’s eyes bugged, and he began shaking the letterscroll with one clawed green hand in an attempt to put out the flames. Poseidon, a handsome godboy with pale turquoise skin and eyes, jumped from his seat in the front row. “Don’t worry, Professor Ladon. I’m on it!” he called. He grasped the long handle of the trident he always carried and extended its drippy three-pronged end toward the letterscroll. As drops of water sprayed from the trident’s prongs onto the papyrus, the flames quickly fizzled out. “Thanksss,” hissed Professor Ladon. He smiled, baring huge, sharp dragon teeth. Athena’s blue-gray eyes widened, and she drew back a little. The sight of those teeth never failed to startle her. But Poseidon grinned back at the teacher, unfazed. “No problemo.” As godboy of the sea, he was all about water. He loved tinkering with the fountains here at MOA, and had designed a magnificent water park with polished marble slides, gleaming fountains, and pools of turquoise water down on Earth. “Asss I wasss about to sssay,” the teacher continued, wisely holding the papyrus scroll farther away from his long flame-spewing dragon snout this time. “I will now read the letterssscroll. HAVE THE PARK ALL TO THEMSSSELVES. Persephone nodded. “Uh-huh,” she said. “It sounds really a-maze-ing.” Both girls giggled at her little joke. The king had officially named his park Minos’s aMAZEment Park because its central attraction was a cavelike labyrinth. Which was basically a simple maze with numerous passages that ran beneath the king’s palace. The park had been designed and built by Daedalus. He was the most famous mortal inventor and architect on Earth, yet he was only sixteen years old! As the goddessgirl of crafts, among other things, Athena was a keen inventor herself. In fact, one of her inventions—the olive—had proved so useful to some mortals in Greece that they’d named their city Athens after her. In a contest at MOA earlier that year, her olive had even beat out the water park Poseidon had invented. “So which of us get to go?” asked a dark-haired, dark-eyed godboy named Apollo. Good question, thought Athena. She caught Persephone’s eye again and crossed her fingers. Persephone crossed hers back. Because who wouldn’t want a chance to preview a fabulous new funpark? Everyone laughed, including Apollo. It was true he was the godboy of prophecy, but apparently he hadn’t foreseen the king’s invitation. Or the names of the students who’d be going. The students closest to him inched their hands up to cover their noses and mouths as he spoke. Professor Ladon had the worst dragon breath of any teacher at MOA! “Yesss!” Athena agreed, giggling too. However, Poseidon groaned. He and several other students who hadn’t yet achieved the tenth level slumped in their seats at the teacher’s news. Athena felt kind of sorry for them. But they’d be able to visit Minos’s aMAZEment Park another time, since it would be open for years to come. She and her three goddessgirl best friends had recently made it to the tenth level after an epic battle. They’d defeated a dozen monsters—tough opponents with sharp teeth and claws, and breath even more horrific than Professor Ladon’s! Of course, the monsters hadn’t been real beasts, only magical game projections created by the professor to challenge them in the Forest of the Beasts down on Earth. The forest was where the goddessgirls had fought the monsters to win the tenth level. The place where all students from Professor Ladon’s classes practiced their hunting skills on the first Friday of every month. The rest of the time classes were held here at MOA in this very classroom. Persephone turned to look back at Hades, godboy of the Underworld. He flashed her a smile. The two of them had been crushing on each other since forever. Looking at Professor Ladon, Hades asked, “When do we leave?” He and several of his godboy friends, including Apollo, had also reached the tenth level recently. “After ssschool on Friday. We’ll ssspend all day Sssaturday at the park, and return Sssaturday evening,” Professor Ladon replied. Then he explained how the invitation had come about. Apparently, Daedalus had been impressed with the Forest of the Beasts when Professor Ladon had showed it to him nearly a year ago. In fact, after studying the magical beasts the professor had created, Daedalus had been inspired to design a mechanical version of the Minotaur, one of the most terrifying of the forest beasts. It would inhabit King Minos’s new labyrinth. “To thank me for providing inssspiration for his mechanical Minotaur, Daedalusss convinced King Minosss to invite ssstudents from my classsses to the opening of the park,” Professor Ladon said in conclusion. A shiver ran down Athena’s back as she thought about the Minotaur. There were actually three of them in the Forest, and each was huge and bull-like, standing upright however, with horns, clawed hands, hooves, and a gold ring in its snorting nose. Terrifying, indeed! But she didn’t have time to dwell on the matter of the Minotaur. Because the class moved on to studying the languages of the beasts, until the lyrebell rang. Out in the hall after class ended, Athena, Persephone, Apollo, and Hades all high-fived one another. “This trip is going to be so fun,” said Persephone. The boys took off for their next classes still buzzing about the park, but the two girls waited outside the classroom until Aphrodite and Artemis showed up for third-period Beast-ology. After Athena and Persephone shared the good news about the upcoming trip, the four girls grabbed each other in a group hug, jumping up and down in excitement. “I can hardly believe I get to hang out with my GGBFFs at a funpark this weekend instead of doing homework,” said Athena. Her friends giggled. “So who else will be going? Do we know?” Aphrodite asked, running a hand through her long, golden hair. It was threaded with pink ribbons that matched the sparkly pink chiton she was wearing. As befitted the goddessgirl of love and beauty, she was breathtakingly beautiful. Several boys passing by turned their heads to glance at her adoringly before continuing on to their classes. But to her credit Aphrodite hardly noticed. She might be beautiful, but she wasn’t stuck-up about it. “How lucky that they’ll both be able to come,” Athena replied. Apollo was Artemis’s twin brother, and Actaeon was Artemis’s crush. “Heracles will get to go too. And Pandora.” Heracles was Athena’s crush, and Pandora was her roommate in the girls’ dorm on the fourth floor of MOA. So she knew that both had achieved the tenth level. Maybe Heracles and I can sit together on the ride over, Athena thought with pleasure. Two weeks ago, they’d worked with other students to build a fabulous carousel inside the Immortal Marketplace—a mall halfway between MOA and Earth. Since then she’d gotten so busy with homework, Cheer, and other projects that she’d hardly spent any time with him. “So we’re missing one girl and one boy to make up the group of fourteen that Minos invited in that letterscroll, right?” asked Persephone. The lyrebell began to ping, signaling that third period was about to begin. “Yikes, better get going,” said Aphrodite. While nudging Artemis into the classroom, she sent Athena and Persephone a little wave good-bye. “Me either,” Athena called back. It wasn’t every day that they got an exclusive invitation to the park that mortals and immortals everywhere were talking about. Everyone had been counting the days till it opened. She still hadn’t heard who the seventh girl and seventh boy were by the end of the school day when she climbed the marble staircase to the girls’ dorm. Pandora was sitting at her desk working but immediately turned to greet Athena when she entered the room they shared. “Not that much,” said Athena, answering only one of her questions. That was usually enough to satisfy Pandora. Besides, the two girls would wind up talking all night if Athena tried to answer all of her mortal roommate’s questions. She liked Pandora, but sometimes it was hard to get any real work done when she was around. That girl was so curious about everything and asked so many questions that her bangs were shaped like question marks! Athena put her stuff away and settled at her desk, which was near the window, beyond her bed and wardrobe. On the opposite side of the room were Pandora’s identical bed, wardrobe, and desk. Inspired by the thought that she might get to meet Daedalus in a few days, Athena opened a drawer and pulled out a sheaf of papyrus. The she picked up her favorite ink-filled blue-feather quill pen and tapped it against her chin, thinking. “Need some help?” Pandora asked eagerly. Quiet drove her crazy. “The plow?” Pandora answered without hesitation. Athena stared at her in surprise. “Really? But it’s so useful.” A tool she’d created to help farmers, its iron blade could break up the soil and cut furrows in the ground, into which seed could later be sown to grow crops. “Awkward, dull, and boring? Gosh, tell me what you really think, roomie,” Athena teased. She adored inventing new things, worked hard to perfect them, and was proud of each and every one of her inventions, big or small. So Pandora’s criticisms stung. But then, Athena had asked for feedback. She grinned, softening her words. “You make good points, though. Come to think of it, I have heard grumbling about that plow now and then.” She had received plenty of praise for her other inventions—though, to be fair, she could understand why people would think using a plow was hot, sweaty, hard, and awkward work. To Athena’s relief her roomie soon announced that she was leaving for a while to hang out with Medusa, a snake-haired, green-skinned mortal MOA student. Now Athena could get some real work done! After her roommate left, Athena began to sketch new design ideas for improving what Pandora—and farmers, apparently, too—considered her most hard-to-use and boring invention. The plow. But how could she improve it? Would a sharper blade help? More comfortable handles for pushing? Wheels? She sketched out each idea as it came to her, but just as quickly rejected those ideas, tossing her sketches over her shoulder until they littered the floor. As she continued drawing, her frustration grew. Nothing she came up with seemed like it would improve her current design enough to make a difference in the ease of her invention’s use. She was stumped. Fresh out of good ideas. “Hello? It’s me,” Artemis said, opening the door and coming in. Her three dogs—a beagle named Amby, a greyhound named Nectar, and a bloodhound named Suez—pushed their way inside with her. “Yikes, sorry,” said Artemis as the dogs trampled on the papers spread all over the floor. “S’okay,” Athena told her. “That’s my throwaway pile.” Somehow Nectar managed to poke his head through a sheet of papyrus that she had rolled up and twisted into a hoop to resemble a wheel. The girls laughed as he ran around shaking his head back and forth, trying to free himself. “What’s up?” Athena asked as Artemis took pity on Nectar and slipped the paper “wheel” off his neck. The dog rose on two hind legs, put its front paws on Artemis, and licked her cheek before going back to nosing around the room with his two companions. After scooping up the papers on the floor, Athena tossed them into her wastebasket. Then she, Artemis, and the three dogs left to meet up with Aphrodite and Persephone. As the four goddessgirls hurried toward the market, Athena thought about Heracles. Since he was also going on the Crete trip, he’d probably be at the market with the others. She could hardly wait to talk to him about the trip and tell him how excited she was about getting to meet such an illustrious inventor as Daedalus.